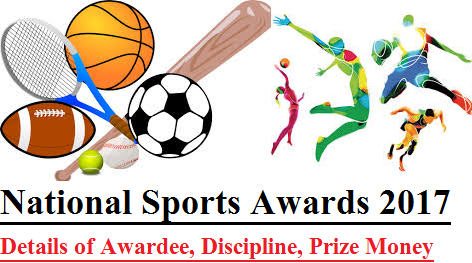 National Sports Awards are given every year to recognize and reward excellence in sports. Rajiv Gandhi Khel Ratna Award is given for the spectacular and most outstanding performance in the field of sports by a sportsperson over a period of four year, Arjuna Award is given for consistency outstanding performance for four years, Dronacharya Award for coaches for producing medal winners at prestigious International sports events, Dhyan Chand Award for life time contribution to sports development. (i) Rajiv Gandhi Khel Ratna 2017 (ii) Dronacharya Awards 2017 (iii) Arjuna Awards 2017 (iv) Dhyan Chand Award, Apart from a medal and a citation, Rajiv Gandhi Khel Ratna Awardee will receive a cash prize of Rs. 7.5 lakh. Arjuna, Dronacharya and Dhyan Chand Awardees will received statuettes, certificates and cash prize of Rs. 5 lakh each.